We have some great news for you fanboys who haven’t left the house all day and just can’t wait another second for FUEL TV to premiere “UFC 148 Primetime: Silva vs. Sonnen II” tonight at 7PM ET/4PM PT. We’ve just obtained a copy of the documentary for your viewing pleasure. 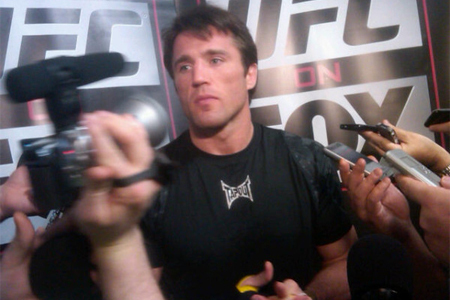 The 30-minute special provides a behind-the-scenes look at middleweight king Anderson Silva and Chael Sonnen (Pictured) as they prepare for their heavily hyped rematch. After manhandling Silva for nearly five complete rounds at UFC 117, Sonnen was abruptly submitted with only 110 ticks remaining on the clock. The sequel jumps off next Saturday inside MGM Grand Garden Arena in Las Vegas, Nevada. For those of you who can’t stand watching shows on your computer monitor, you better set your DVRs because replays of “UFC 148 Primetime: Silva vs. Sonnen II” airs Sunday at 4:30AM ET on FUEL TV and Friday at 2AM ET on FX.